Collision and Body Shop - Acme Automotive Center Inc.
Acme's state-of-the-art Collision and Body Shop offer customers a unique and hassle free experience. ​Satisfying our customers is our #1 goal! The facility is tailored for optimum efficiency and superior quality workmanship. ​Acme's staff will work with you to ensure you will receive the finest quality service and repair available today. As our valued customer, you will receive the finest quality repair available. We examine your car thoroughly to determine the full extent of damage incurred, and negotiate on your behalf with your insurance company about anything their inspection missed. You get complete, top quality repair, without the hassle or expense to you. As a member of the business community, we adhere to a Code of Ethics, our pledge to you of honesty, integrity, safety, and craftsmanship. Our trained professionals are ready and willing to help you in any way they can. For us, satisfying our customers is the most important goal we have. We offer easy to read and understandable computerized estimates. Our staff will take the time to inform and explain your repair service to ensure your satisfaction and answer all of your questions. Today's modern factory finishes incorporate multiple layers of highly specialized paints. Without the most sophisticated techniques and training, hi-tech factory finishes cannot be duplicated. We have made a major investment in the finest painting system available. We take special pride in our ability to match factory finishes as the final step in our restoration process. Only factory matched finishes are used, with special attention to paint texture, gloss, and hue. Most of today's modern automobiles are of unibody construction. Unibody repairs need highly specialized equipment, operated by expert technicians. 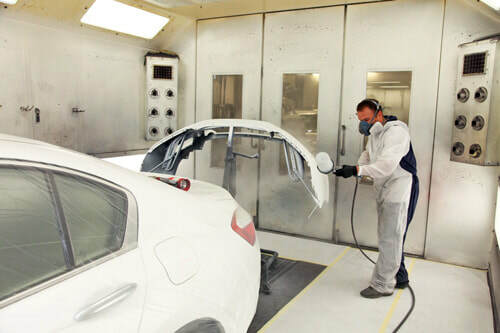 All damage is repaired to factory specifications on our "State of the Art" collision repair systems. All of our high-tech technicians have been extensively trained on the newest methods and equipment in use today. Our technicians use only the finest of material and equipment in repairs. Our goal is to educate and work through your repair to get you back on the road. For more information contact The Massachusetts Auto Body Association (MABA). Differences in repair estimates are common. A lower estimate may not include all necessary work. If you're not sure why one estimate is different form another you've received, please ask us. For your protection, choose a Massachusetts registered repair shop for repairs. Our registration number is 801. Let us help you negotiate your claim with the insurance company. If you have been in an accident - PLEASE CALL 413-584-3710 or CONTACT US TODAY FOR A FREE CONSULTATION.